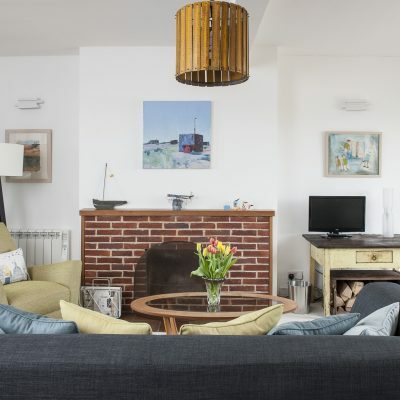 When Louise Convert and her family bought their seaside home they’d already tackled the renovation of three local properties. 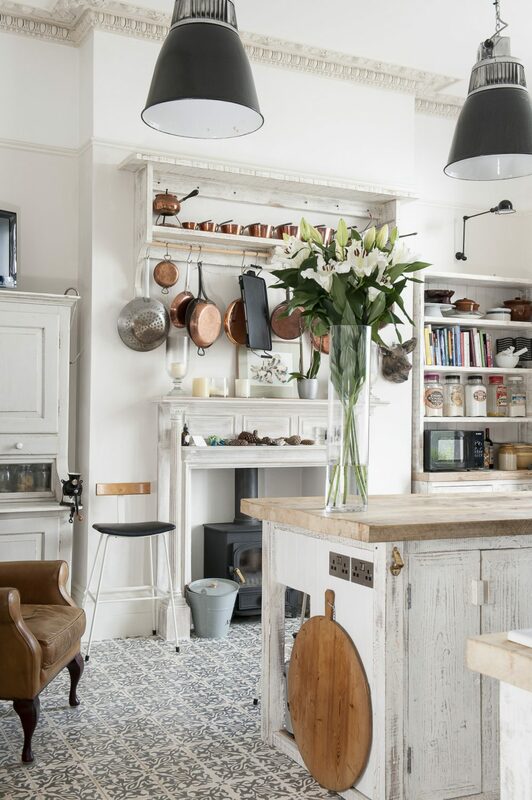 The building they had settled on – a Burton, in a lovely secluded position – had been converted into three flats, and what stood between the couple and their ideal St Leonards home was another massive restoration project. It’s a joy when you find a Burton that once was lost and now is saved – and saved, moreover, in spectacular style. 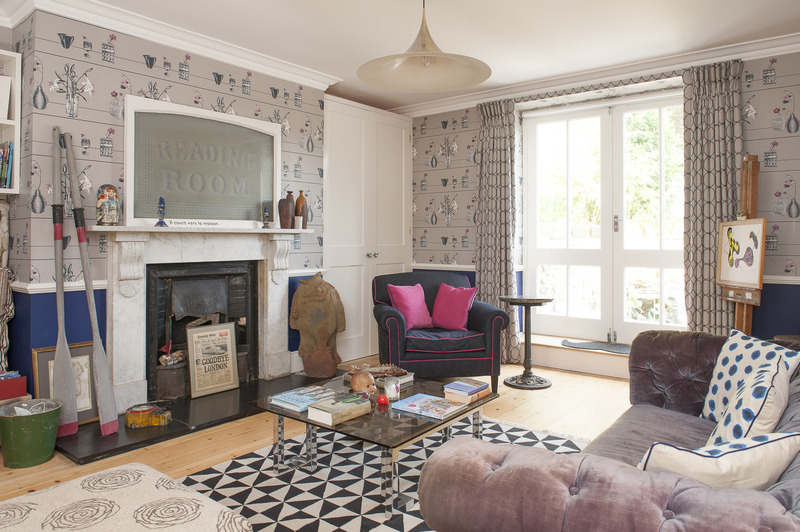 Louise, an interior designer, and Guy knew St Leonards well when they first saw the house, having been introduced to the area by Guy’s father. 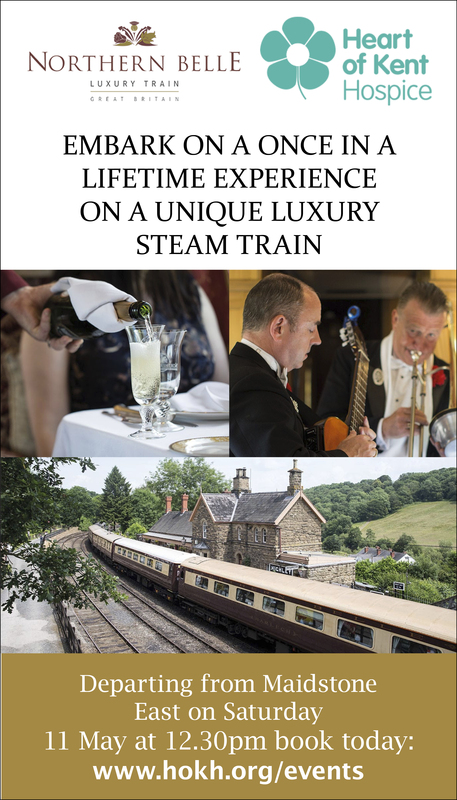 Nor were they strangers to renovating local property – once they’d come to know the town they had bought, renovated and sold two flats and a cottage there. The couple stumbled upon the majestic terrace and in addition to keeping their eye on what was coming up with the local agents also personally identified the properties, on the market or not, that most appealed. 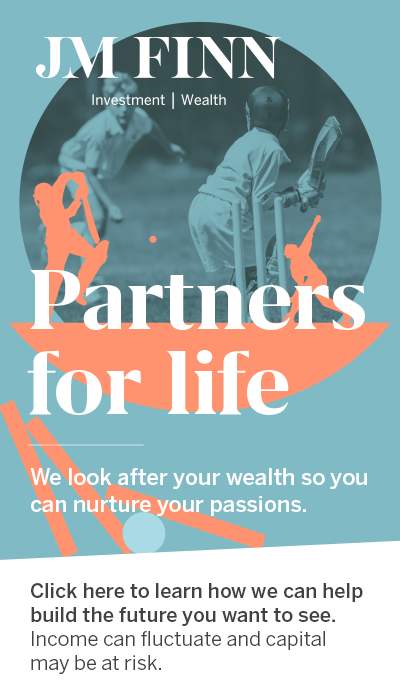 “We then set about leafleting the owners and making them aware that we would be very interested in their property if they were ever considering selling,” says Louise. “At first we heard nothing and then an owner contacted us to let us know they’d like to sell their upper flats,” she says. This was outstanding news because even two floors of a Burton – once restored to their former glory – would provide a stunning family retreat. Now the only minor detail that stood between the couple and their ideal St Leonards home was a massive restoration project. 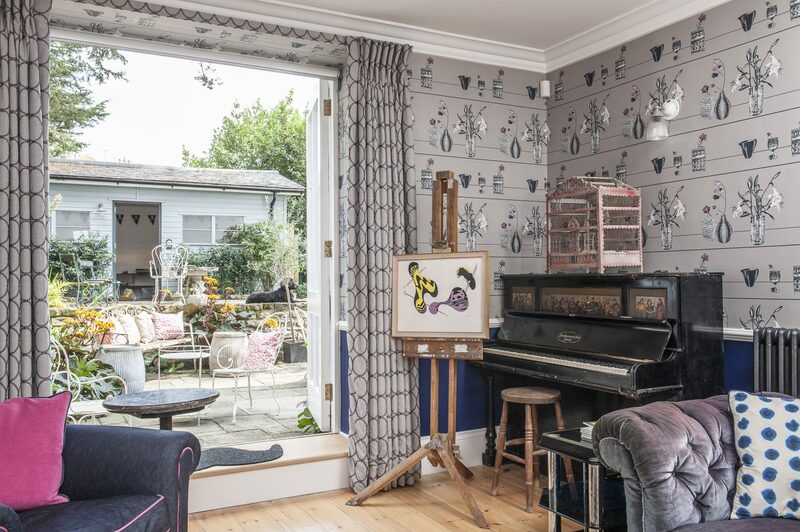 “The fabric of the building was essentially sound but the building conversion into flats meant there was a huge amount of restoration to do while at the same time equipping and styling the house to serve as a 21st century family home,” says Louise. A listed building, there was also the local planning authority to deal with – and St Leonards is understandably vigilant when it comes to protecting its Burton heritage. However, even on too brief acquaintance one gets the distinct impression that the word ‘no’ does not quite have the same entomological significance to Louise as it does to lesser mortals. Calm and measured discussions ensued with the result that honour was satisfied all round – yes, an opening would be allowed but, no, it wouldn’t be quite as large as Louise had first requested. The only slight hiccup arrived when the owner of the basement flat suddenly decided that they too would like to sell. Clearly this wasn’t in either the plans or the budget but it was a chance the couple simply couldn’t let go begging. The plans and the budget changed! 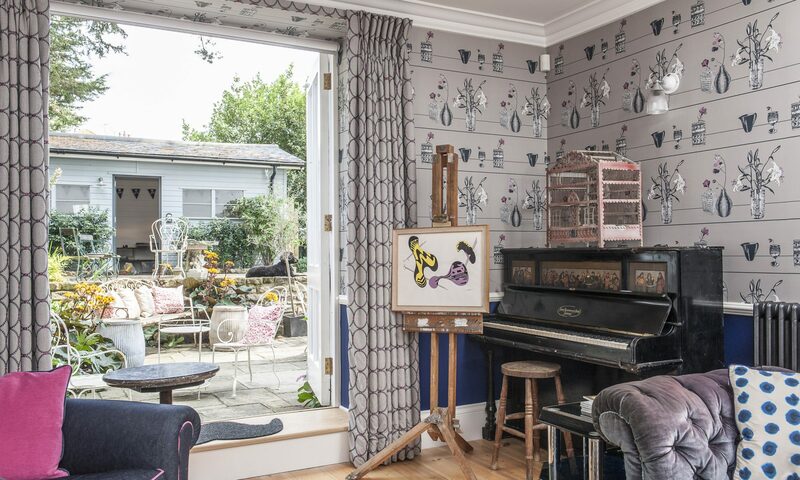 “This not only gave us a third more space again but also a rear courtyard garden which, once we’d renovated it, was going to be a lovely secluded outdoor space,” says Louise. And so it has become. Louise has extended the original York stone of the basement floor out though French windows to form a patio and built-up flower beds. A step or two takes you up to a second level, a summerhouse and an area of tough, imitation lawn on which her children Annique and Felix, aided and abetted by their father, are assembling a children’s pool. The unexpected extra space offered by the basement floor has been put to good use providing a comfortable family room and a fun games room. In the family room old oars lounge against one side of the fireplace and a huge terracotta fish which probably once graced a fish and chip shop stands on the other. 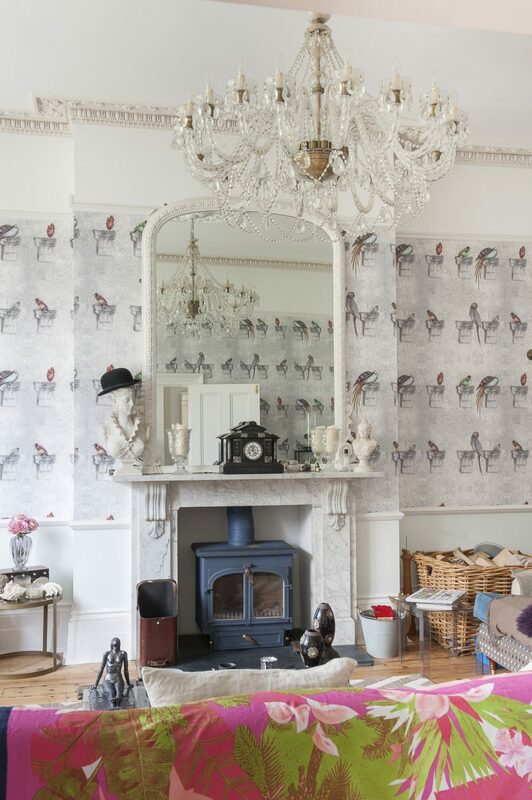 The wallpaper is by local artist Louise Body. 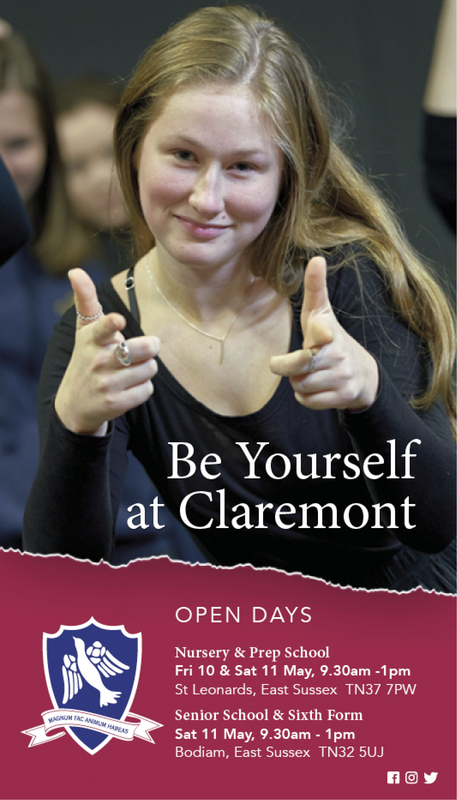 “Wherever possible we’ve tried to use local artists and craftsmen – there’s such a wealth of talent in this part of the world, ” says Louise. 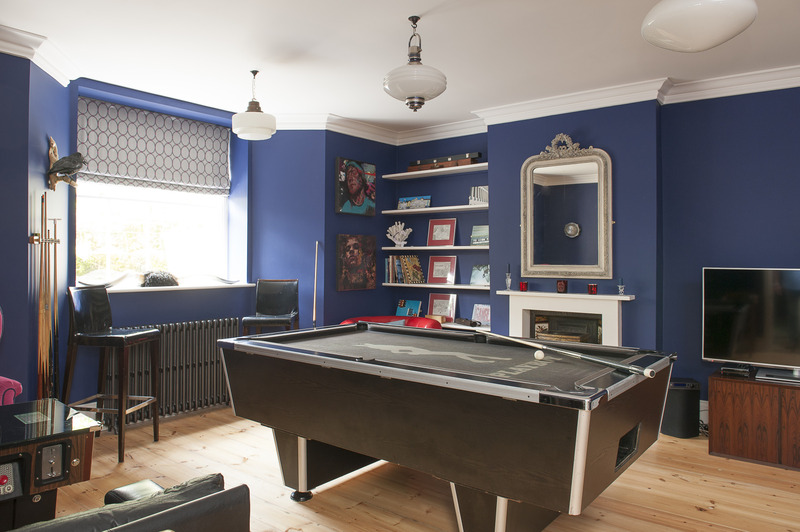 The boys’ blue playroom is dominated by a full-size pool table with a supporting cast of an original Space Invaders console. On the walls is a Robert Sample – one of a number around the house – and an old barber’s neon sign restored by St Leonards-based Philip Oakley. The basement also has its own elegant bathroom complete with steel William Holland bath, Welsh slate wall tiles and Fired Earth flooring. 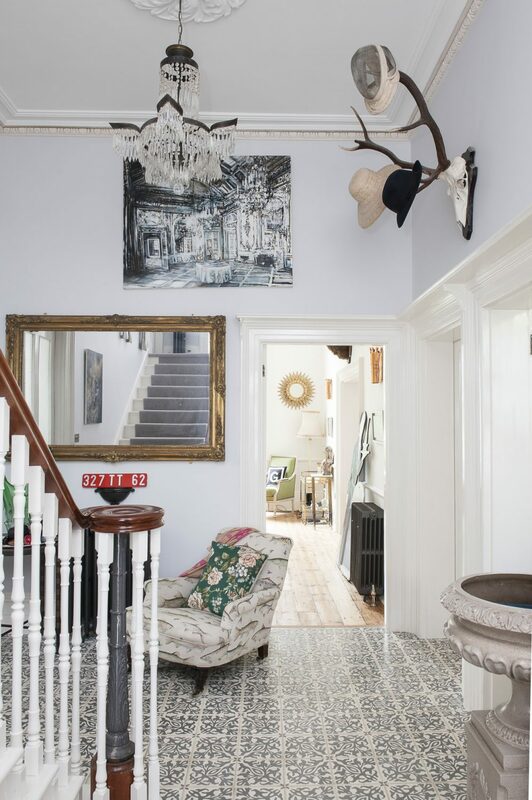 Above in the big, coolly tessellated hall is something you don’t often see outside a brief encounter with an illegal substance – a Robert Sample, an Anders Moseholm and a pair of elk’s antlers upstaged by a full sized cut-out of a giraffe. 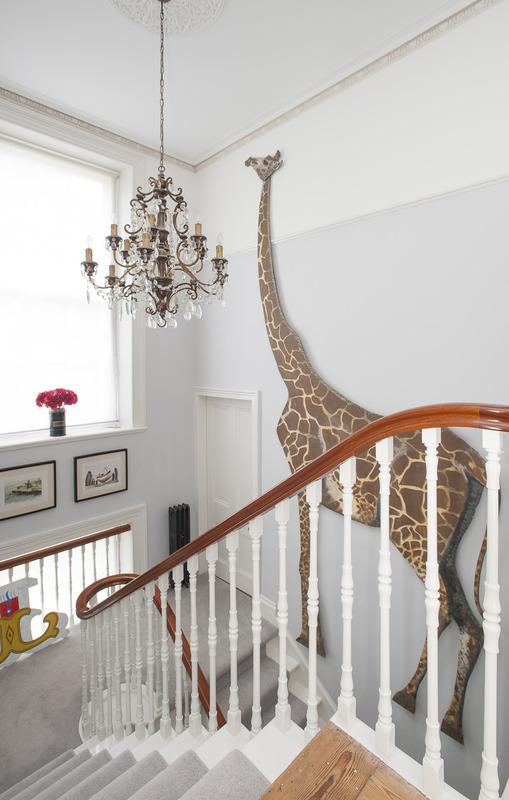 The giraffe is on the stair wall and reaches virtually from the ground to first floor, giving some idea of the space that Burton built into his houses. It also immediately gives you an insight into Louise and Guy’s life and their whole approach to their beautiful St Leonards retreat. 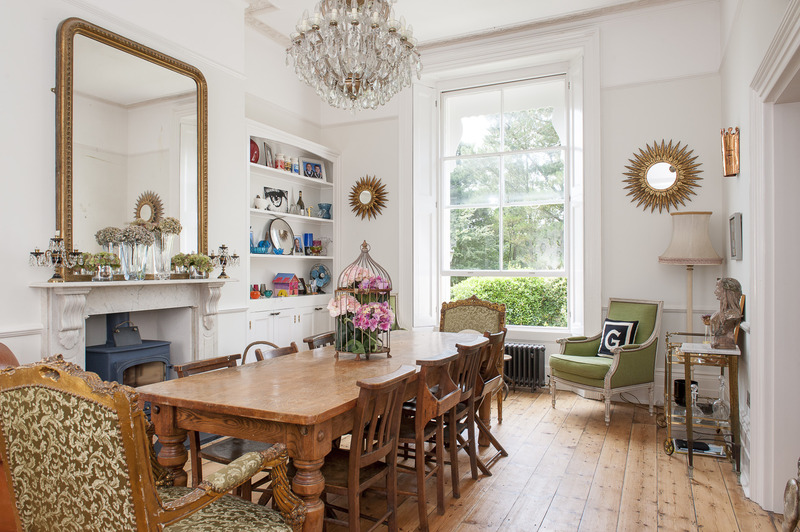 Given a seriously grand Burton house, the temptation to furnish it grand style must be considerable. But it is a temptation, however, that the couple have resisted, apparently with ease. 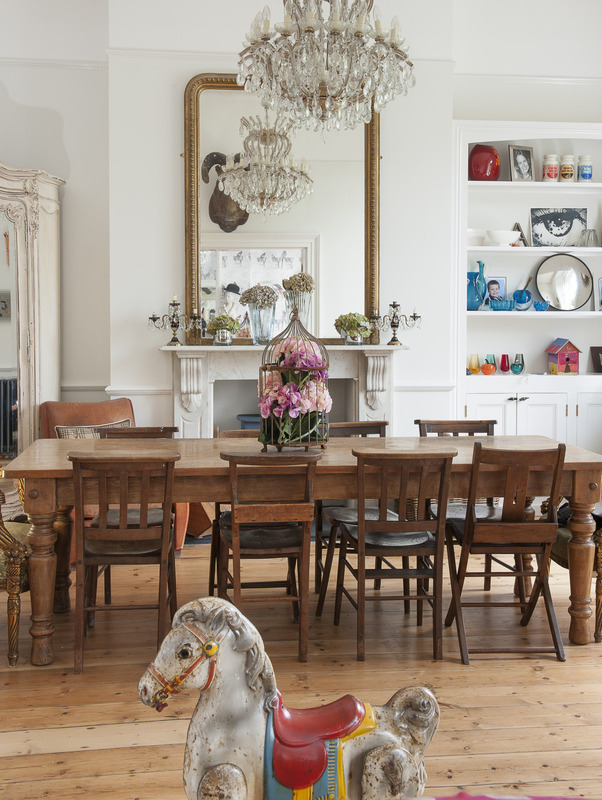 What they have created is not an elegant period pastiche but a fun family home, which is a joy for the children. The kitchen off the hallway was once a bedroom roughly the size of Belgium and all the original cornicing has been lovingly restored to its former intricate glory. 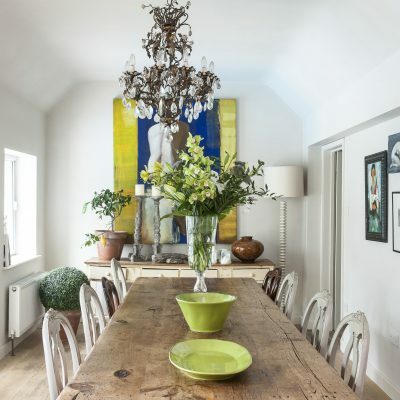 The hand-crafted lime washed units from the Hastings and Bexhill Wood Recycling Project give a distinct seaside feel to the room and from the ceiling over the central island hang some great and chunky old Czech factory lights. The drawing room is wonderfully bright with light gushing in through the generous panes. 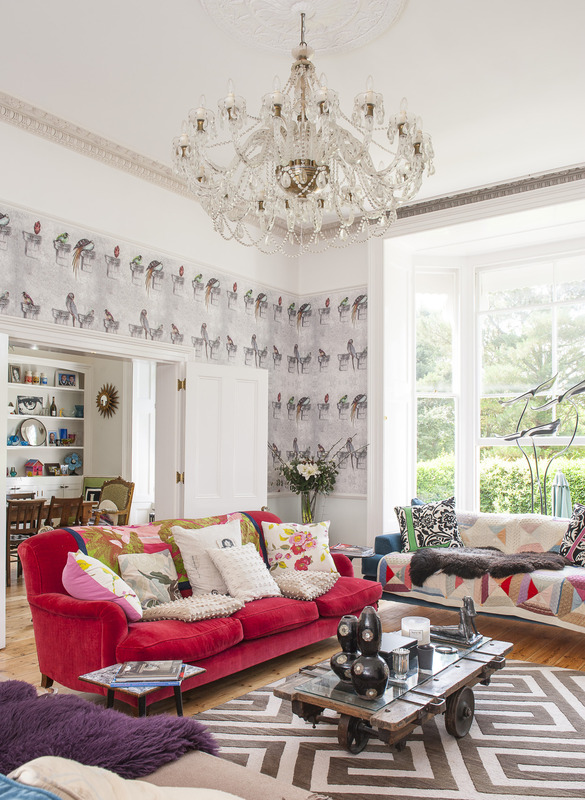 The huge chandelier was a Bexhill find and the fun parrot wallpaper is, again, by Louise Body. 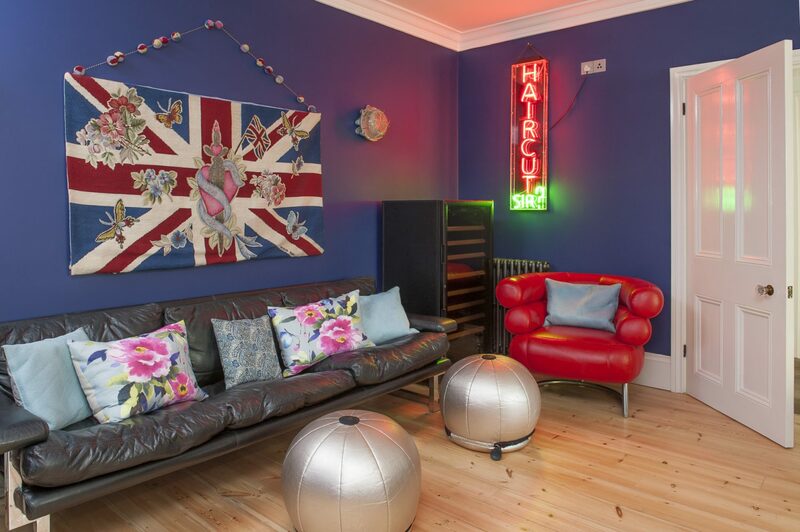 In the centre of the room is a coffee table made from an old factory trolley and around it are three velvet sofas, two blue from sofa.com and the other red by Nina Campbell. The cushions and black and white rug are from the The Rug Company. In the window is a steel sculpture of three manta rays, originally designed for a garden but now adapting to indoor life. 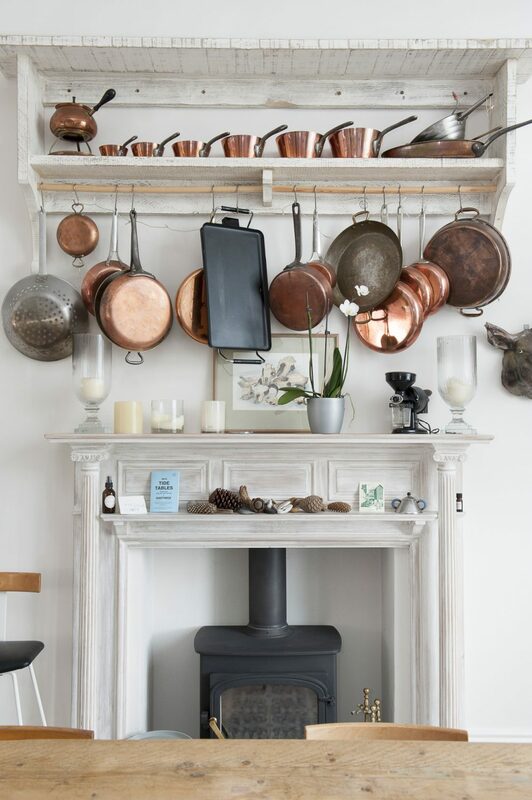 The elegant fireplace with its woodburner is just one of many that Louise and Guy had to find to replace those lost in the building’s conversion to flats. “There were only one or two left and we’ve tried to match them the best we can,” says Louise. And so through the disputed opening in the original wall and into the dining room where one might expect a very grand Georgian dinner table complete with silver candlesticks. But in keeping with the informality of the place the couple have opted for a big oak runway of a refectory table surrounded by an eclectic collection of chapel chairs. Over the table is another impressive chandelier and over the white marble fireplace is set a large Louis Philippe mirror. 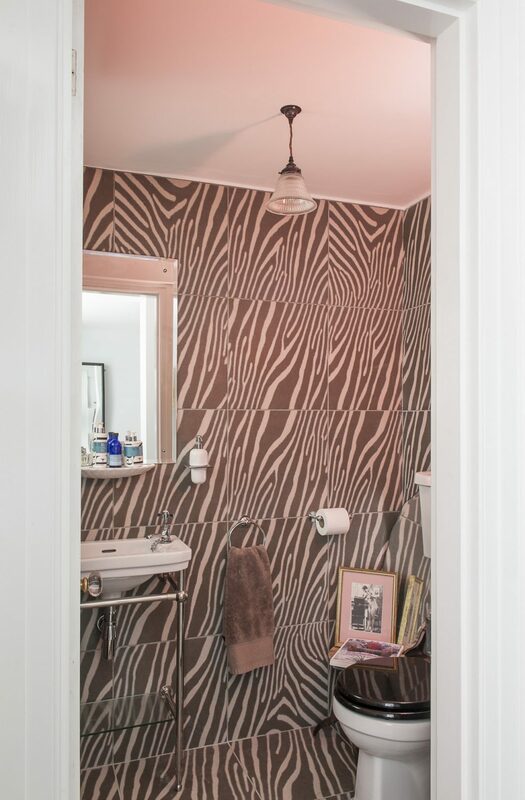 Upstairs past the giraffe, a distorting fairground mirror and another large Sample and the first stop is Felix’s room and more Louise Body – this time seagulls. 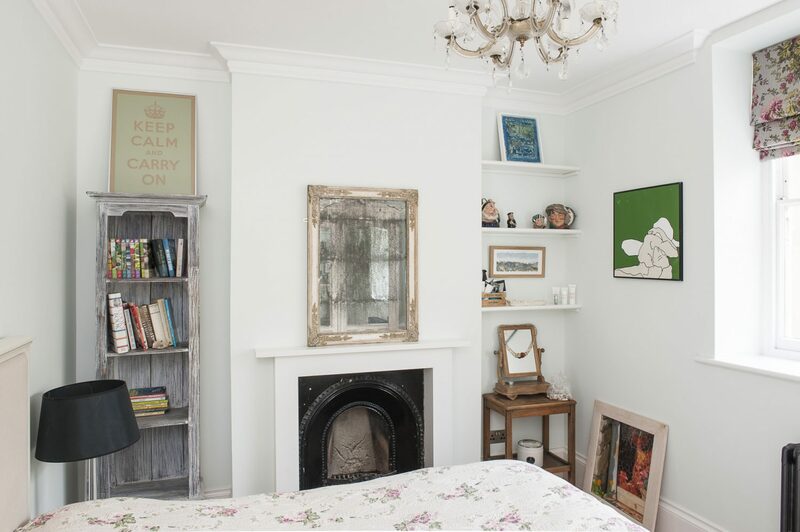 Over his bed is a huge elephant’s head and in the corner a distressed French armoire with a chicken wire front housing his clothes. A touch of grown up elegance is provided by a basket chandelier, French leather club chair and white Louis Philippe mirror. Annique’s bedroom is very similar – again with a French armoire – although hers has glass – and a gilt Louis Philippe. 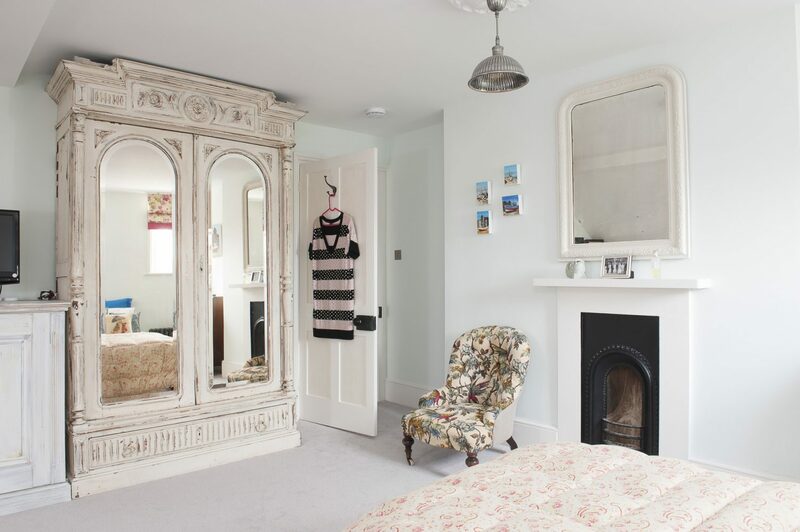 However, Felix’s is a very blue boy’s bedroom and Annique’s is the epitome of a girl’s domain – pink with a pretty grey and white French bed and a light-up horse’s head above from Rockett St George. Her dressing table is an old steel kitchen table that for years Guy wanted to throw out but which now has at last found the perfect home. From the window she has a lovely sea view over the garden. 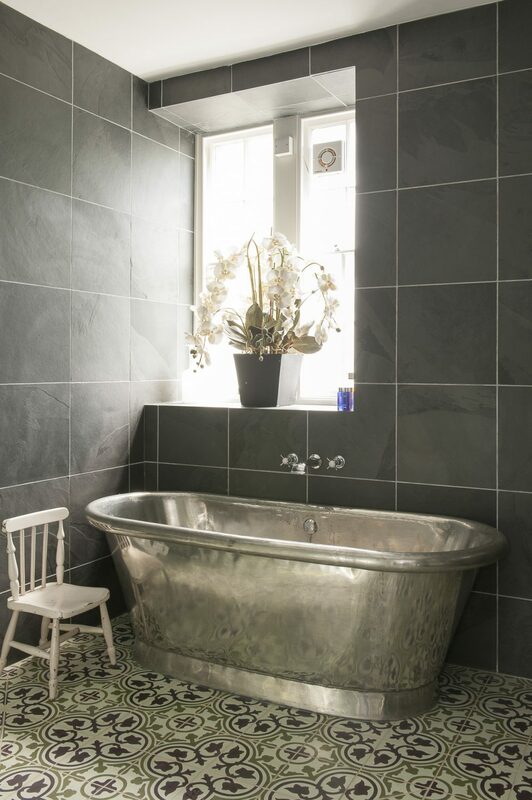 Their bathroom sports a great black steel-riveted bateau bath Louise found through eBay and black and white mosaic tile flooring from Tile Design in St Leonards. 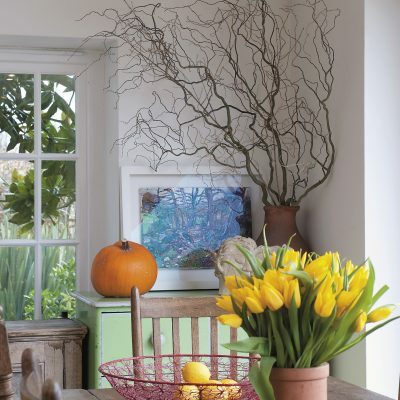 The delicate driftwood table by the bath came from French Connection Home. “They’re really doing some very pretty stuff at the moment,” says Louise. 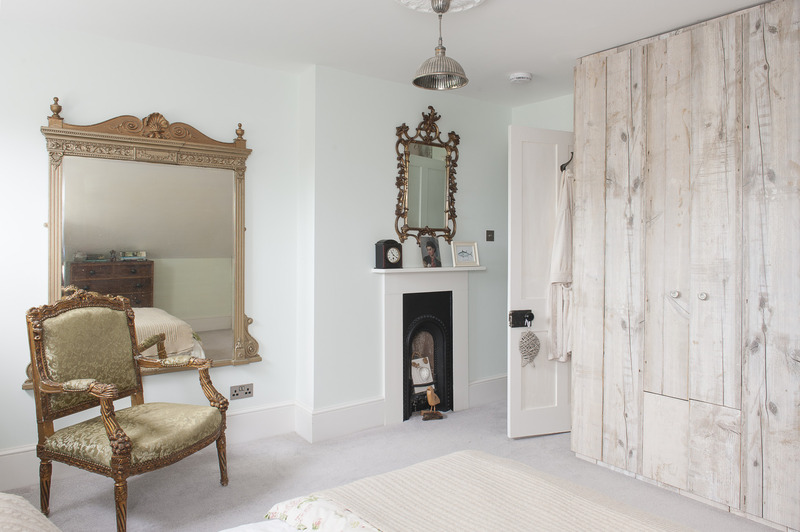 The couple’s master bedroom is predictably stunning. It was here that the couple found one of the house’s original fireplaces, its beautiful tiles painted over. It has now been returned to its former glory and set off by a white Louis Philippe. The velvet button backed headboard and bed come from sofa.com and the Cameroonian tribal headdress from Sideshow Interiors in St Leonards. Flanking the window are two huge and – unusually – unpainted French armoires. 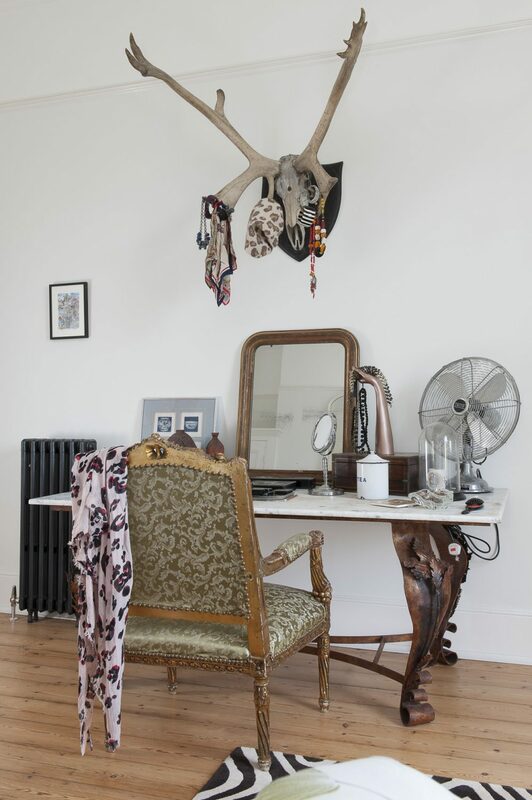 Necklaces and scarves hang from elk antlers above a white marble dressing table with seriously sturdy but graceful brass legs. 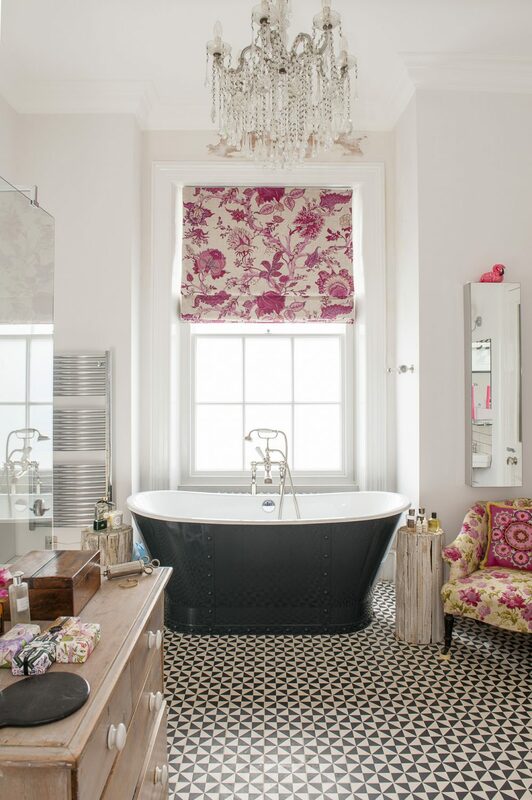 Centrepiece of the en suite bathroom is a glorious William Holland brass bath and above it a chandelier which once belonged to Louise’s grandmother. 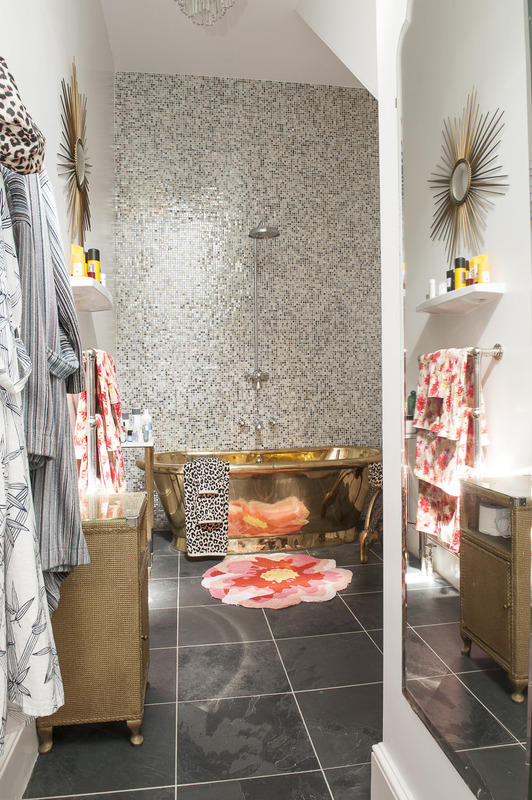 On the top floor are two cool and elegant spare bedrooms and a stylish shower room. Louise and Guy’s resurrection of this lovely building is a triumph. 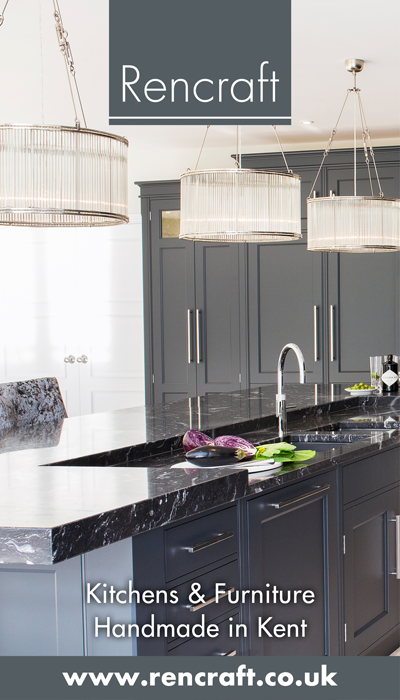 Not only have they restored the exterior and interior with huge sympathy and to the highest of standards, they have created a wonderful home that is both elegant and fun. Decimus would be delighted. The fireplace in the couple’s master bedroom has been stripped of paint and returned to its former glory. 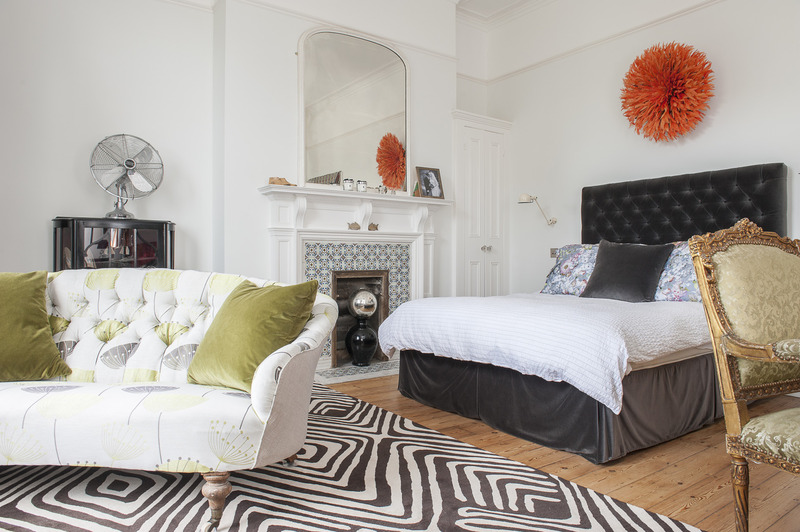 The velvet button backed headboard and bed come from sofa.com and the Cameroonian tribal headdress from Sideshow Interiors in St Leonards.